During the past month or so we've been recounting some of the shortline railroads I hit on a trip between New Jersey and Florida with my brother Bruce back in December. 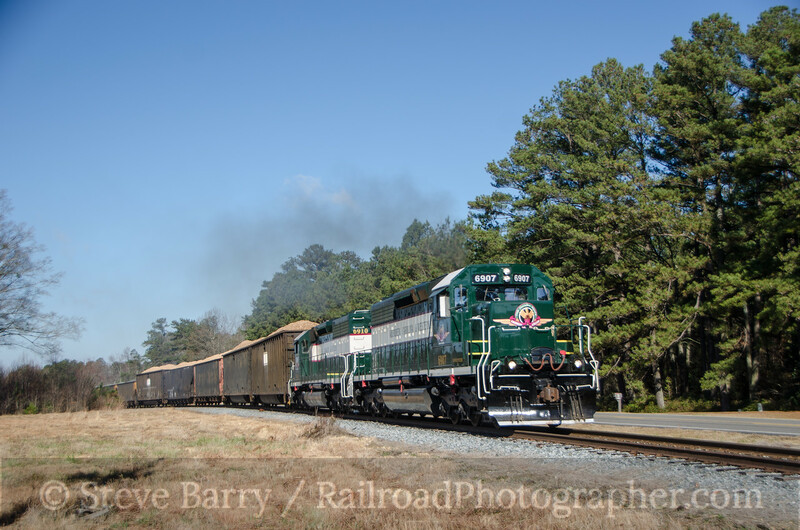 We devoted three posts to days spent on the Sandersville Railroad in Georgia, the Aberdeen, Carolina & Western in North Carolina and the Lancaster & Chester in South Carolina. We also had a post about an unexpected encounter with the Hilton & Albany using street running at night. 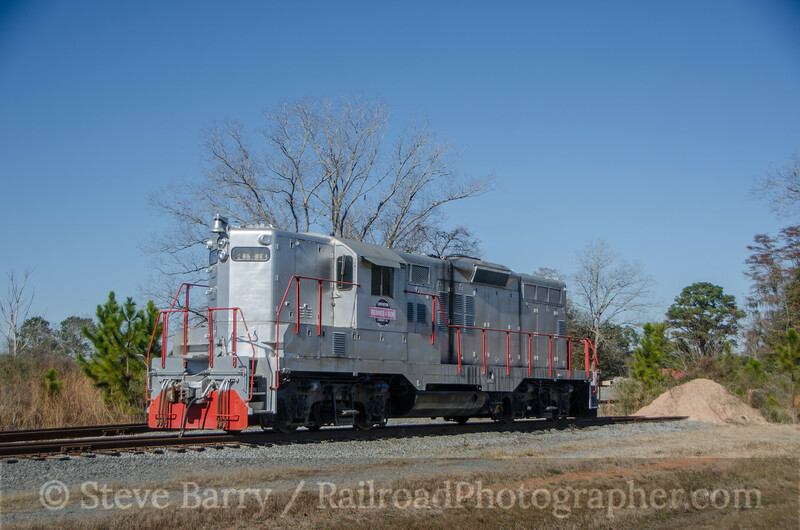 We wrap up our shortline coverage for this trip with a short chase of the Georgia & Florida Railway. We had finished shooting the Hilton & Albany in the early morning hours of December 12. After getting a little bit of sleep, we headed down to the yard office of the Georgia & Florida Railway in Albany to see what was up. 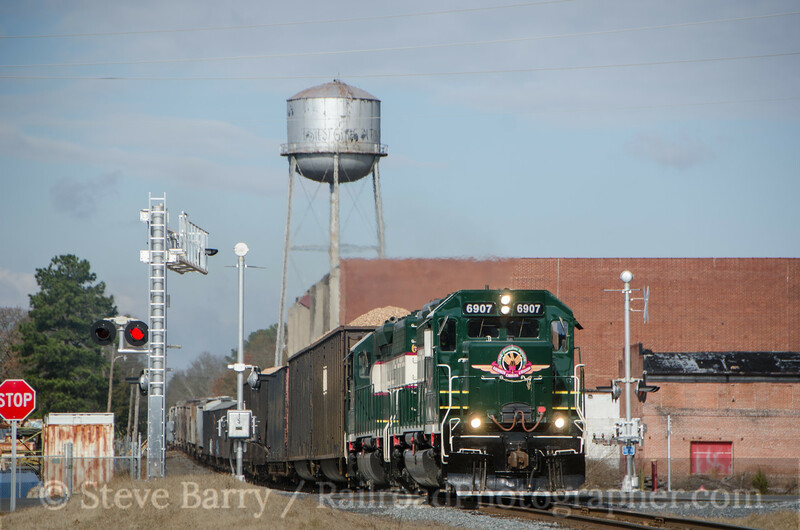 They had a coal train in Albany with BNSF Railway power that would be going out later in the morning, and there was also a train running between Greenville, Fla., and Adel, Ga., that would be going out after lunch. 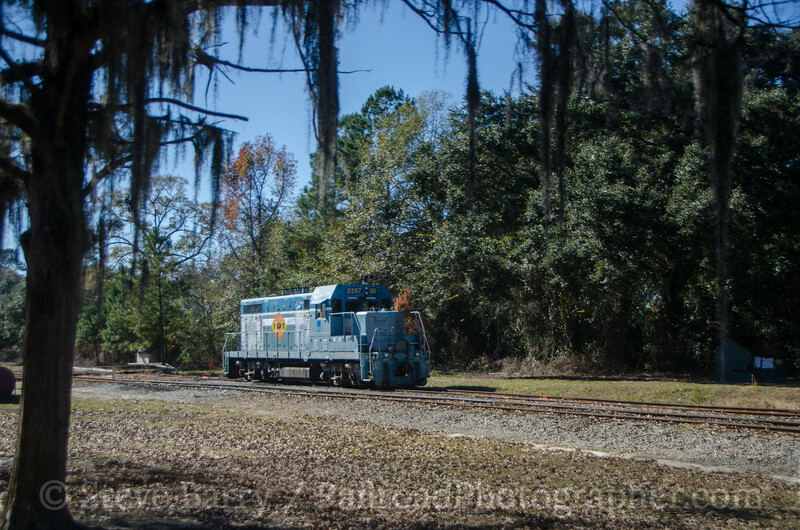 Since we wanted to shoot shortline power and not locomotives from major railroads, we opted to head towards the Florida line in search of the train from Greenville. While flying down the freeway near Sparks, Ga., we spotted an old Electro-Motive Division (General Motors) switcher at the Reames Concrete plant. Of course, we needed to investigate. We checked in at the office and got permission to drive back on the property to photograph the silver unit. Since we were not far from Valdosta on the way down, we opted to exit the freeway and head to the yard of the Valdosta Railway at Clyattville, home of the railroad's largest customer. GP7u was sitting next to the office (in the same place we had seen it back in March). A track maintainer pulled up and said a road freight was out, and told us how to find it. Alas, we followed the tracks all the way into Valdosta and back and never found the train. The day was slipping away and our Georgia & Florida train was theoretically out of Greenville. 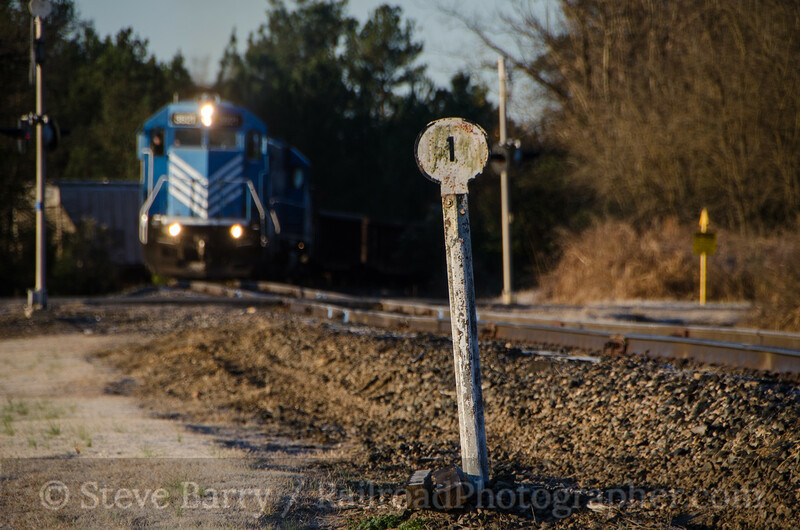 Not knowing how fast the train could move or where it was, we opted to go to the halfway point on the train's northward journey at Quitman, Ga. We set up at a grade crossing south of town and waited. And waited. And waited. After about 90 minutes of that, we decided to head back into Quitman where the Georgia & Florida crossed a CSX branch on a bridge. Maybe CSX would send something while we waited. Once in Quitman, a quick look at the CSX tracks led us to believe that a CSX train would be unlikely. When it seemed all was lost, however, our northbound train made an appearance passing across CSX on the bridge (top photo of this post). The chase was on! Now when I say "chase" I don't mean anything even resembling high speeds. The train was going maybe ten miles an hour, and the lateness of the day meant there were long shadows everywhere. It took us several miles to find a good spot to shoot, and then took the train quite awhile to reach us. Our second shot was near Morven. Now the sun was setting, but the slow train speed worked to our advantage. We could predict where the train would be right after sunset and have plenty of time to set up strobes for a twilight shot. 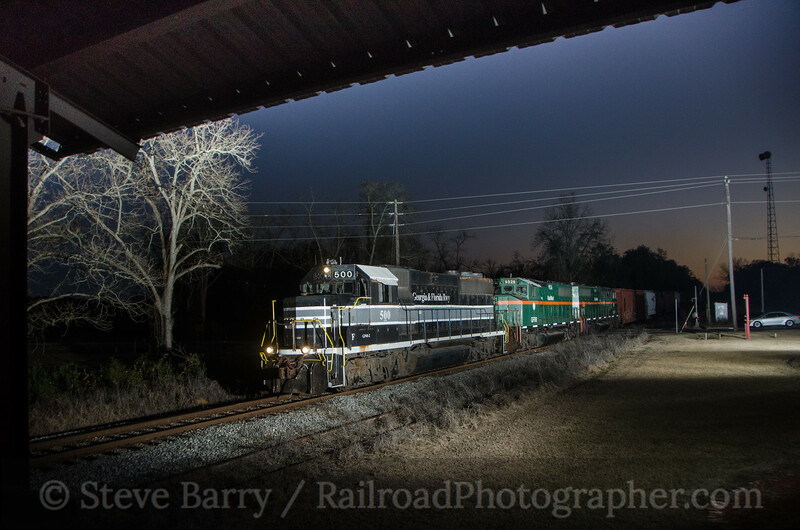 We picked the town of Barney, Ga., as our location and started getting the lights up. Right on cue, just after the sun set and while there was still some orange in the sky, the train showed up and we got our third and final shot of the chase. Since we were in Georgia, a peach shed made an appropriate place to frame up the photo. All in all, our three-shot chase covered about 17 miles in 91 minutes. You can see more photos from the day here. In December 2014 I headed south with my brother Bruce from New Jersey to Florida. 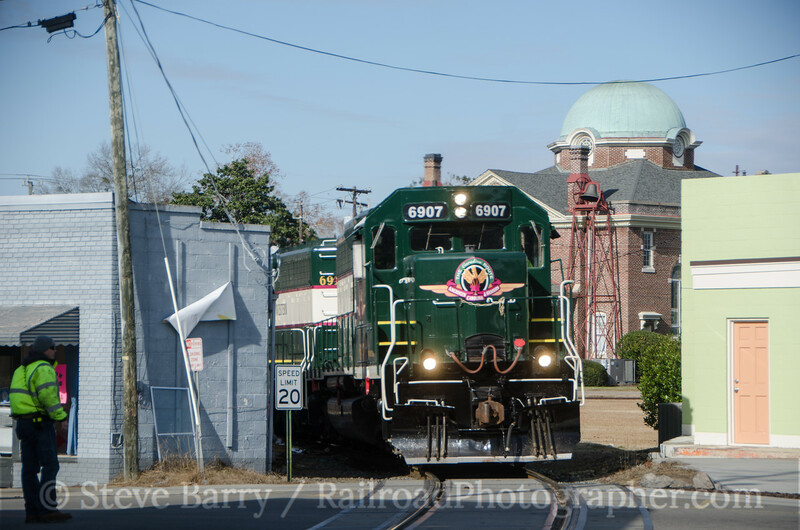 Along the way we spent the better part of a day each on three classic shortline railroads of the South. 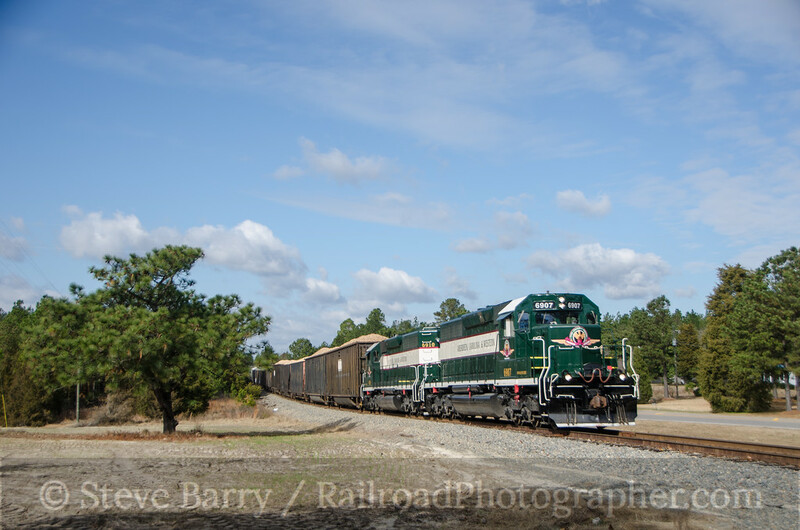 In previous posts we looked at the Sandersville Railroad in Georgia and the Aberdeen, Carolina & Western in North Carolina. 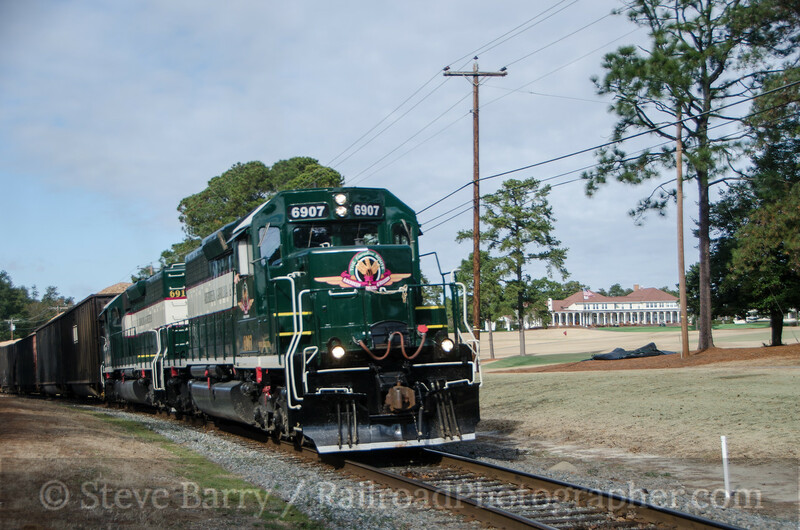 In this post we wrap up our series with a day on the Lancaster & Chester in Chester, S.C. 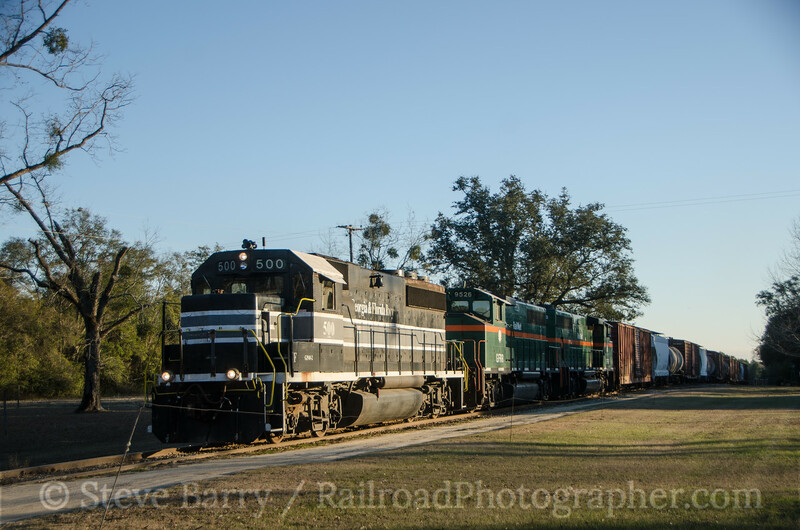 The Lancaster & Chester Railroad traces its roots to the Cheraw & Chester Railroad, which was established in 1873. In the Cheraw & Chester was purchased at auction by Colonel Leroy Springs and renamed the Lancaster & Chester, running 22 miles between its namesake towns. The line was a three-foot narrow gauge railroad until 1902, when it was converted to standard gauge so it could tie into the rest of the U.S. national rail system. The railroad dieselize in 1946, and in 1965 it began operating EMD end-cab switchers as its primary power. 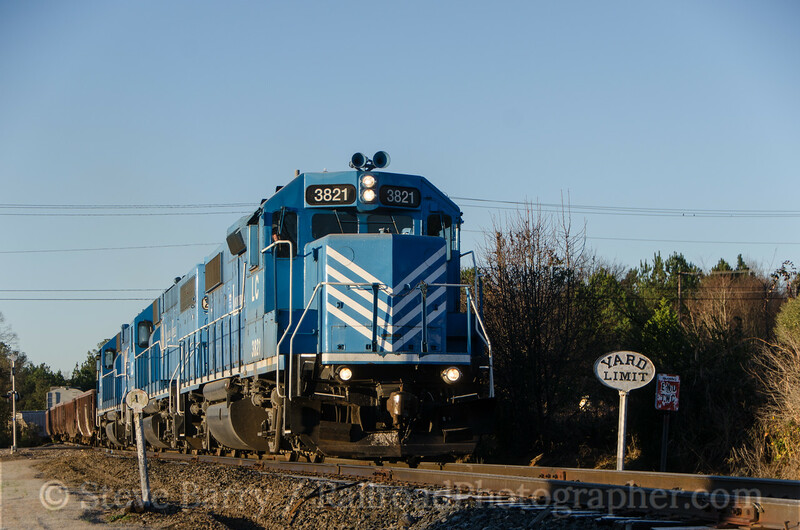 This practice came to a close in 2003 with the arrival of standard EMD road power. 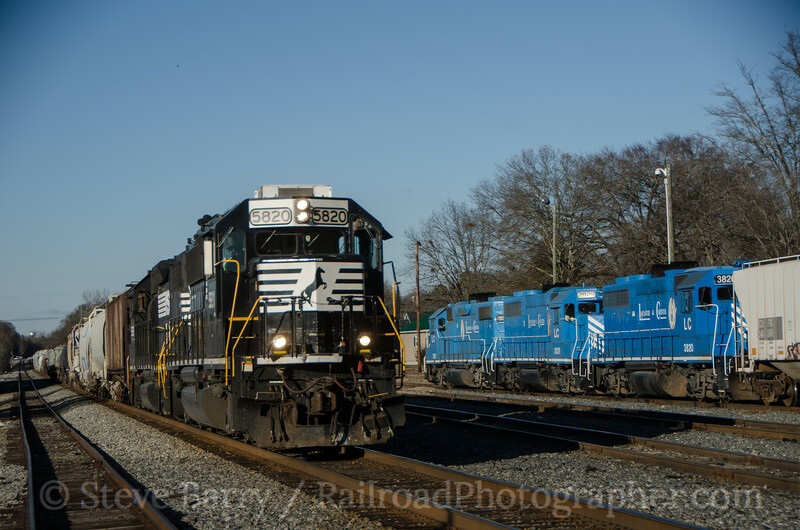 On the day we visited the railroad, December 10, 2014, the crew came on duty shortly after 8:00 a.m. at the interchange with Norfolk Southern in Chester. 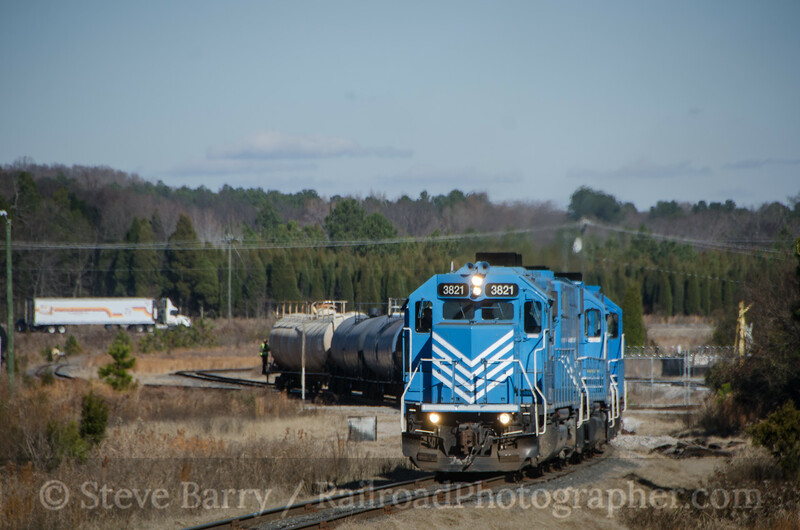 There is a large industrial park about six miles outside of town, and the train spent the morning making two round trips between Chester and the park. Unfortunately for us, this six miles of railroad would be all the crew would cover on this day (out of the 22 to Lancaster). We had just happened to pick the day the railroad was holding its holiday banquet, and everyone was given short day to prepare for the evening's activity. We spent the rest of the day camped out at the Norfolk Southern interchange, hoping for something to come by on the NS mainline between Charlotte, N.C., and Columbia, S.C. Alas, the only train that showed up was a local that dropped cars in Chester for the L&C and picked up that day's interchange traffic. It looks like we'll have to make another trip to the L&C in the future to cover more of the railroad. 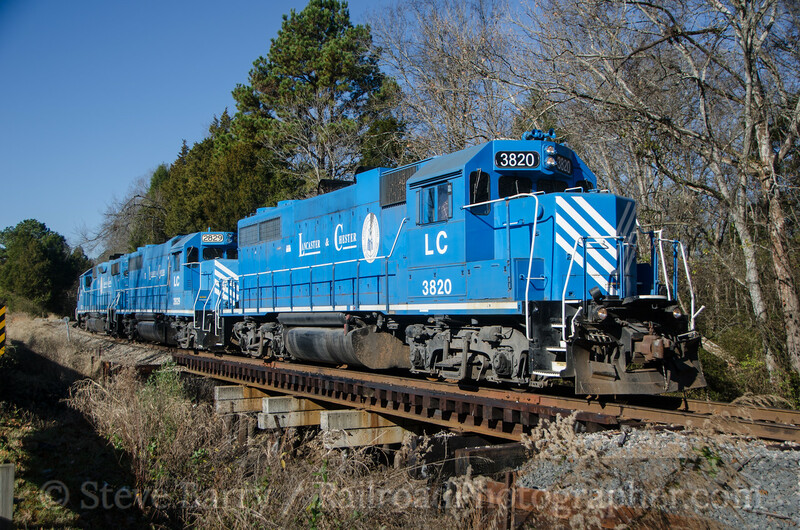 In 2001 the L&C signed an agreement to operate 30 miles of Norfolk Southern track between Catawba Junction and Kershaw, S.C., connecting with the original L&C at Lancaster. There is also an L&C museum located in Lancaster. There will be plenty to do on the next trip to the Springmaid Line. More photos from this day can be found here. In December 2014 I drove from New Jersey to Florida with my brother Bruce and along the way we spent the better part of a day each on three shortlines. 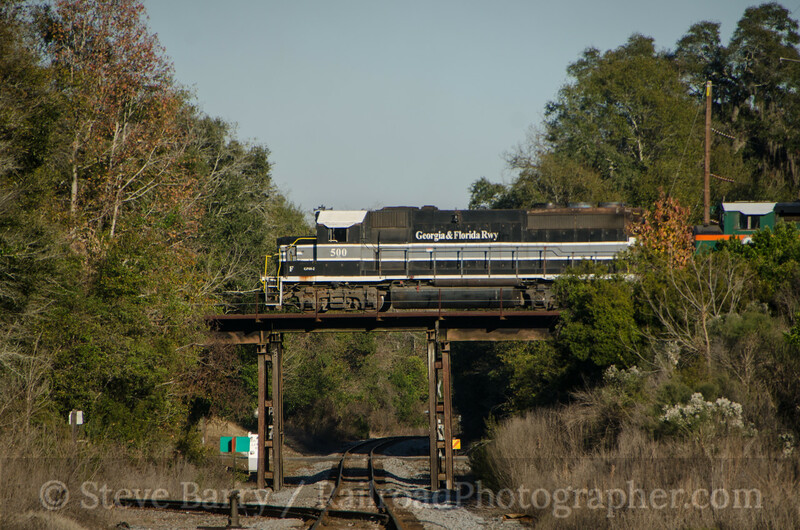 We've already looked at the Sandersville Railroad in an earlier post. This time around, we're going to visit the Aberdeen, Carolina & Western, which is based in the town of Candor, N.C., just west of Aberdeen. In a previous post, we looked at the early days of the AC&W, when it ran with a hodgepodge of locomotives in the colors of Chessie System and the Chesapeake & Ohio, among others. 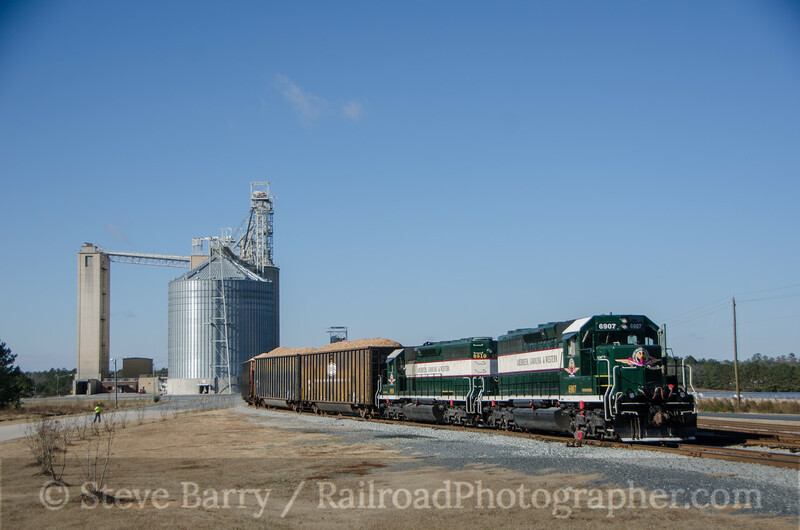 The AC&W was formed in 1987 to operate a former Norfolk Southern branch between Aberdeen and Star. The original shop was next to the old Southern freight house in the latter town. Since then, the railroad has leased trackage from NS from Charlotte through Star to Gulf, N.C., making a giant "T" (the original line from Star to Aberdeen forming the base) totaling 140 miles of track. 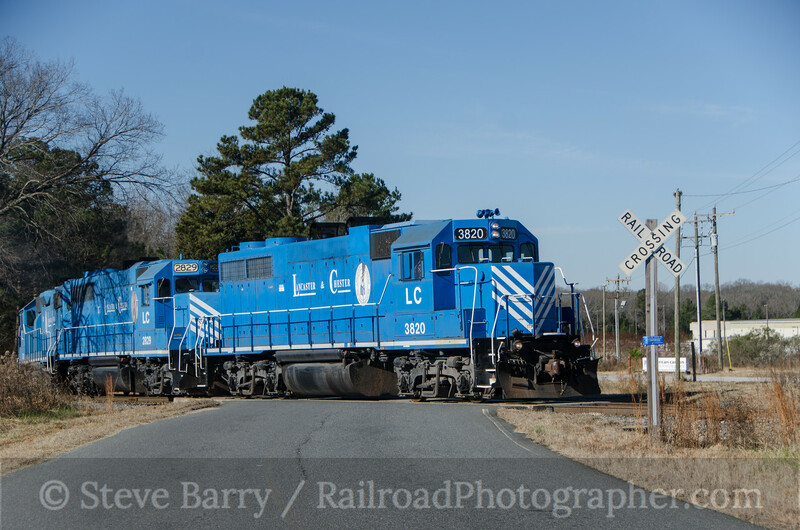 AC&W interchanges with CSX in Aberdeen and NS in Charlotte and Gulf. It also interchanges with both railroads at Norwood. 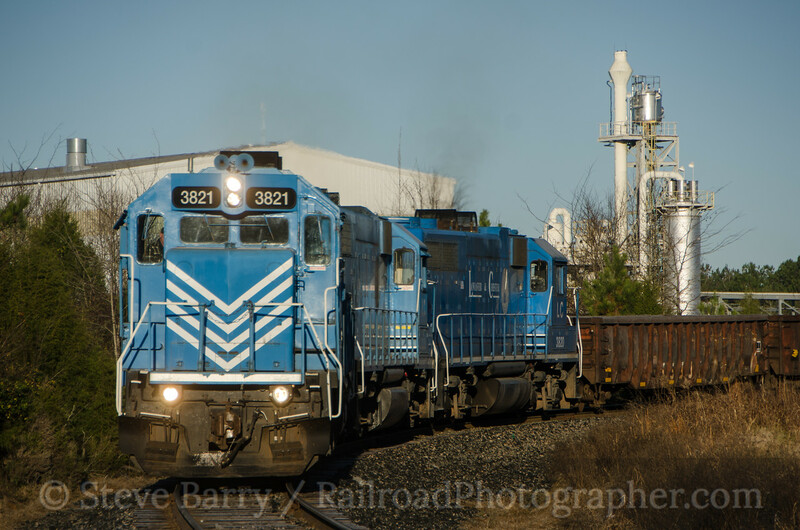 Motive power is attractively painted, such as the pair of SD40-3 locomotives we had on our chase. On the day we chased the railroad, December 9, we first stopped in at the modern shop and headquarters building in Candor. A friendly receptionist checked on operations and told us there was a train being made up at Star that would head for Aberdeen. She also said if we were back in the area in a week or two to stop by and pick up a calendar. We headed for Star and after some poking around finally found the train being readied. Our first shot was as the train left Star (top photo of this post) and again approaching Biscoe (second photo). 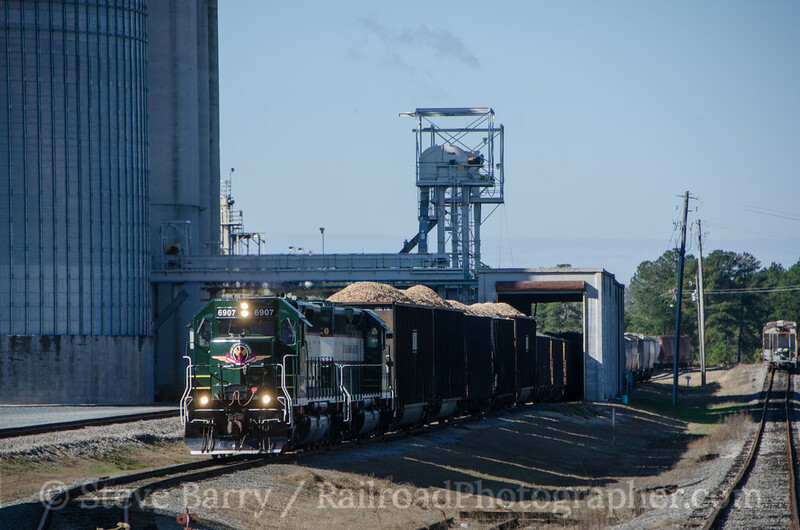 The train paused at the large feed mill in Candor to do some work before continuing on its way southeast. A crewman followed in a truck to facilitate switching along the way. Once done at the mill, the train continued on its way. The train made fairly good time across the somewhat rolling Carolina countryside. It did not stop to work again on the way to Aberdeen. After getting a shot near Eagle Springs, we again got ahead of the train at West End. After West End, the train entered golf country. Pinehurst has hosted the PGA Championship, the Ryder Cup and three U.S. Opens. In 2014 it became the first venue to host both the U.S. Open and U.S. Women's Open in the same year. The train enters Aberdeen and the CSX interchange through a narrow opening between buildings. Once at Aberdeen, the locomotives dropped the outbound cars and picked up cars to return north. Since the train would be against the sun going back, we said our goodbyes to the AC&W at this point. You can find more photos from this chase here.